The recent Ebola outbreak in Africa has claimed nearly 1,000 lives since March 2014 in Liberia, Sierra Leone, Guinea and Nigeria, represents a potential risk for air travelers because the virus that causes the disease can be spread by direct contact with an Ebola victim. Recently, Emirates and British Airways became the largest airlines to suspend airline service in one or more of the most affected countries. Other airlines like Delta have allowed passengers to change flights to, from, or through certain west Africa airports in the affected areas without penalty. Several media outlets, including the Premium Times of Nigeria stated that the first Ebola death in Nigeria was from a man who flew into Nigeria on July 23rd and two died two days later from Ebola. The report also states that the victim had shown signs of illness during the flight. Ebola, also known as Ebola virus disease (EVD) or Ebola hemorrhagic fever, is a severe, often fatal illness in humans, with a fatality rate of greater than 50%. It is caused by a virus that is commonly spread through close contact with an infected person. How can a person get Ebola? A person can become infected with the Ebola virus from direct contact (through broken skin or mucous membranes) with the blood or bodily fluids of infected people, or from contact with objects or environments contaminated with such fluids. What are the effects of Ebola? The effects of an infection are not immediate, with symptoms showing up between two and 21 days after infection. A person who falls ill may experience a sudden onset of fever, intense weakness, muscle pain, headache and a sore throat. This is followed by vomiting, diarrhea, rash, impaired kidney and liver function, and in some cases, both internal and external bleeding. Is there a vaccine or treatment for Ebola? There are currently no approved vaccines available for Ebola. While symptoms such as dehydration can be treated, there is no proven treatment for the underlying viral infection. What risks do airline passengers face? 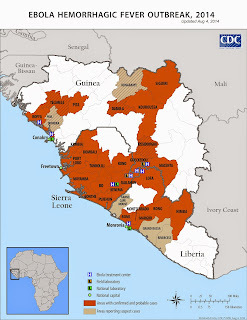 The two most important things that you can do is to avoid travel to areas experiencing an Ebola outbreak, and to seek medical attention before traveling if you are experiencing Ebola-related symptoms.If you already have a trip planned into an area with an active outbreak, you can delay or cancel the trip (check with your airline on their policies for areas of high risk). If you are on a flight where another passenger is exhibiting Ebola-like symptoms, do your best to stay away from that passenger and inform your flight attendant about the situation. If you are unable to do this, avoid direct contact with that person, or with any object or surface touched by that person. Safe Air Travel? - You got it! - No Ebola - No Effects on Travel - The Toughest Response to Ebola on Earth is my WVD - I got the power (like a God) to wipe out Ebola, AIDS, Malaria, TB, Colds, Flues, etc. in just a few days - I got my WVD - The Weapon of Virus Destruction - Just an exercise for a minute a day - The cure and prevention of any diseases, known on Earth for more than 2 million years - Even Tibetans don't know how to stay absolutely healthy all the time - The price of the WVD for the whole world is 5 billion EURO/BUCKS/BP.